Zettai Karen Children: The Unlimited - Hyoubu Kyousuke is a spinoff the original Zettai Karen Children. It is presented by Manglobe, a Japanese anime studio, who is known for some of its other works involving supernatural such as Deadman Wonderland, Ergo Proxy, and The World That God Only Knows. And now here we are with their latest presentation. Now, this series can spell out a lot of questions for potential fans. One of most common ones may be something along the line of, “Do I need to watch the original Zettai Karen Children?” From my perspective, it is not necessary but I would say that it can open some insight as well as background to this spinoff. But of course, this isn't the parent series. This is UNLIMITED featuring Hyoubu Kyousuke as the star of the show. The way the series is adapted is quite a peculiar one from my point of view. Even from the starters, we can clearly see that Hyoubu Kyousuke is not your typical hero. Rather, he can be seen as an anti-hero with the way he dresses, the way he acts, the words he speaks, and the action he commits. With his silver jet hair and floating around the city, he is a man of many mysteries especially behind that devious smile. Even from the beginning, he seems to have devious plans from his head. For example, he has himself taken prisoner on purpose for the reason to save one of his own partners in crime. He often thinks before he acts and is calculating toward his goals. Additionally, Kyousuke seems to be a man with a brilliant mind and often plans strategically in order stay ahead of his adversaries. As the leader of the mysterious organization, P.A.N.D.R.A, Kyosuke shows why he is the leader with his ruthlessness when events calls for it. He really is a star of his own show here folks. Having seen the original series, Zettai Karen Children, this spinoff originally put me on odds side with Kyousuke. In fact, he is an antagonist from the original title. Here, he is portrayed as a protagonist. (although I see him more as an anti-hero) I found out the easy way during the first few episodes when Kyousuke is able to pull off his plan in his own 'heroic' effort. With that, he even meets a new friend by the name of Andy Hinomiya. He has a mysterious power of his own that can be compared to a certain unlucky protagonist from another series. I won't spoil here so watch more to find out. At any rate, he is introduced as an anime original character who joins P.A.N.D.R.A. His friendship with Kyousuke seems to be based on both fear and respect. Yet, they do work hand-in-hand and often times gets the job done. Speaking of anime original, there is the cute Yuugiri. She is a strange girl with the ability to read minds but that often puts her at odds with society. She is even viewed sometimes as a 'monster' for just being an esper. This isn't surprising though as the world often sees those who are special regarded as being a threat to society. Among others of the team includes includes some returning characters from the original series such as You Fujiura, Momiji Kanou, and Shirou Magi. They make up the firepower of the team and gives P.A.N.D.R.A a reason to being so feared and dominant. So, this spinoff takes the setting in a more dark city atmopshere as opposed to the 'family oriented' atmosphere that the original Zettai Karen bought to us years ago. Honestly, who remembers that stuff anyways? In most of today's anime series, the market often aims at viewers for fan service, gore, and those romance subplots. Thankfully, this series avoids most of that and aims directly towards the story along with its strong cast of characters. With his name being set as the title, it is no surprise that Kyousuke gets the most attention even through the flashback scenes we see in later episodes. The other characters aren't omitted either as they all get his or her own little spotlights. The story focuses mainly on the organization that Kyosuke sets up. His idea is to save Espers of his own kind because the way society ostracizes them. In fact, Espers in this spinoff are not seen as saviors of the world but as harbingers of destruction. It can easily be taken the fact even from the pilot episode given Andy's treatment behind that prison. It's cruel for them just because they are “different” from others. The way I see this though is an utter misunderstanding. In fact, some of the people who treats the Espers themselves can be seen as the real monsters to society. It's irony at its very best. However, this shouldn't be entirely be blamed on such trivial accusations that Espers are evil. There have been facts which proves the existence of espers to be a threat in the case of criminals in the series. As a matter of fact, Kyosuke's father ran into a case many years ago that changed his outlook on espers forever. The series seems to lack the ultimatum for its plot. I guess the long story short here is that this spinoff contains way too many mysteries. It starts off fast and keeps its pace here and there. As mentioned before, Kyousuke acts with a plan through his head and cunning strategies. But most of the time, I find that this is almost redundant. The guy is nearly unstoppable and presented as being a boss. His powers of flight, telekinesis, and super strength is overpowered as he takes the skies and dominates in most of his fights. Even from the original series, Kyousuke is calculating and manipulative with his actions. In this spinoff, he is no different and often plays his plans like a chessboard. The pieces are his organization but rather than using them, Kyousuke plays the role of a leader leading them through missions. The action of the series is also full throttle and packed with explosive warfare. It doesn't run through egoistic dialogues and strange gags but gets straight to the point. Otherwise, it does occasionally lack a bit of flavor as it just seems stale. Additionally, I find the characters' designs to be a bit generic. With the lack of fan service, the characters' clothing makes its impression through..generic designs. Their seemingly lack of attractiveness in their outfits also makes their stance a bit dull. The result often leads to a repetitive fight scenes and in general, a lack of flavor. If they were so 'badass', why not go all out and make the skies your God? Oh wait, they don't need to do that since being OP does all that for them already. In terms of overall visuals, I thought the series did a great job here. Taken on the opposite side of the original series, Unlimited makes its way of with more of a cutting dark age background. It's not on a dystopian level but gets its point across in that the world the espers live in is not a paradise. The artwork of the city in fact reflects more of a 'gotham' like atmosphere, one where there are criminals and people who prejudices against others just based on personal outlooks.The characters' design in particular Kyousuke show that they are indeed not normal. I mean, look at that silver hair and you tell me if you see that often in real life. It's definitely not something you see every day. The soundtrack of this spinoff makes a strong impression on me. Its organ plays and style of choice in using more of a dramatic tone enhances the theme of a dark series as opposed to the family-oriented Zettai Karen Children. In other words, most of the soundtrack is serious because the series makes its way of being darkier, edgier, and sexier. (in that Unlimited way) The OP song LΛST RESOLUTION (for some reason performed both in English and Japanese), shows the revolution in which Kyousuke sets towards those who are a threat to espers. Oh and those various ED songs? Pleasure to my ears. Overall, this underrated series gets a score of “8” from me. I don't know about you but Unlimited sure got my attention. No, it's not because I watched the original series so I can get a taste of the spinoff. But rather, the characters, setting, and the general mood of the story gives a more defined way of the psychic world. Despite having some generic/shounen fight styles, I feel that this series pulled it off right. It doesn't seemed to be forced and balances itself well between its subplots. Hell, even the flashback arc was an entertaining watch. Ultimately, I would like to ask people to give this series a shot. It's not perfect but a definitely a way to make your time pass by. At least it did for me. After all, time isn't unlimited so make use of it wisely. This series right here is something you should spent that time on. This anime is 12 episodes long. It's fast paced with lots of action scenes, sarcastic moments, sad moments, pretty much everything. When i first saw the first episode i knew i was going to enjoy this anime. It has that compassion side towards it, where not many action anime's have it so early into the anime. I've rated the story 9/10 because for starters, it's 12 episodes long. It's fast paced which i like especially for a short series. The plot makes sense, and the pace is very smooth. The art you see in this anime may remind you of the newer animes, like Hamatora or Jormungand. They spice up the art to look exactly what you'd want! For an evil bad guy, or a good guy with hatred in his soul, they certainly focus to bring out the key details to make you want to go, "WOW This anime Has it!" I love the OST's. It's so filling, with every battle scene the background music is insane! Legit hype. Definitely lives up to having one of the best OST's out there. The character development is fairly decent. At first you have your Main character, (DONT WORRY NO SPOILERS!) Who's trying to find his power. How do they go upon this? Well...he meets new people, and blah blah blah. . It goes on from there! I rated this a 7/10 solely because of how they went about to show how he develops, mainly towards the acting part and just...the way how they did it. I solely enjoyed this anime to the fullest! I've watched it all and I Absolutely Love it! It's just like Hamatora, HxH 2011, A hint of DBZ maybe, Jormungand, basically it's an all around perfect anime! Obviously there's more anime's i can name that are similar to this one, but that would just make this review too long xD. Yes it's true, a 10/10 Anime! Whoever watches this anime will come out loving it! The art, the humor, the plot, the characters, everything! Well. . . what really caught my attention was how the characters acts towards one another. It's not that usual anime where if somethings bothering one of our MC's, the other MC will just be like, oh, okay well hope you get better. NO! It's more than that! Its...Its...ART! Zettai Karen Children: The Unlimited was actually one of the more surprisingly good series I watched out of the Winter 2013 lineup. One of the nice things about this series is while it does have the Zettai Karen Children name slapped to this series, you don't actually have to watch the original Zettai Karen Children to understand the story. I certainly hope that didn't deter anyone from watching this series, because it nearly deterred me since I originally had no interest in the series. I originally thought you had to watch the first Zettai Karen Children to follow the plot...and after hearing about how mediocre that series was, I wasn't looking forward to it. As I said, you fortunately don't have to sit through Zettai Karen Children to understand it since this is more an alternative setting that's connected to that series. The story follows the story of a powerful anti-hero esper named Kyousuke Hyoubu that leads PANDRA, a band of espers against a society that generally doesn't accept espers equally. Espers are commonly imprisoned or used by government organizations for their own personal gain. The story begins with Kyousuke breaking into an esper prison to rescue one of his PANDRA members that had been imprisoned there. While in the prison, he receives assistance from an inmate named Andy Hinomiya. After successfully accomplishing the prison break, Andy decides to join PANDRA and assist Kyousuke with his goals of recruiting espers and trying to bring an end to humanity's rule over espers. However, it turns out Andy has a different goal in mind when he joins the group. Overall, I found the story to be fairly good and the plot itself to be outstanding. I was intrigued by the plot and found it to be an interesting set piece on how unforgiving society can be towards people that can be considered different. The strongest aspect of The Unlimited was its animation. I found the animation to be downright gorgeous. The character designs were precise, clear cut, and reflected the personalities of each character rather well. However, where this series really shined was the atmospheric animation when an esper was releasing their power, like when Kyousuke or Yugiri were releasing their powers. It really did a great job of creating a feel that espers are all-powerful beings and provide a reason why they are feared in a normal human society. My jaw dropped at how gorgeous the animation was when Kyousuke turned off his limiter. I have to give credit to Manglobe, they are on their A-game when they create dark, atmospheric anime like this one. This is not a sunshine and rainbows series. The animation is dark, gritty, and can get downright graphic at times. While I wouldn't put it in the same category as a Deadman Wonderland for its grittiness or Ergo Proxy for its dark atmosphere, it seems to do a nice job of balancing the two. It's actually impressive considering Shishou Igarashi (Director) and Jun Takagi (Chief Animation Director) aren't the most experienced in anime directing. This was definitely a good stepping stone for their careers if they can continue to create animes as polished as this one from an animation standpoint. The music and voice acting was also incredibly strong as well. The music really knew how to set the mood and I have to give a ton of credit to Koutarou Nakagawa for creating such an excellent soundtrack. Personally speaking, I have a lot of respect for his prior works that include Code Geass, Gosick, and Scryed to name a few. He brought out his best for this series as well and it paid off. The seiyuus were also remarkably well-cast, with most of the original Zettai Karen Children cast returning to their roles for this series. Kouji Yusa returned to his role of Kyousuke, which I must be glad for because he seemed to play the role of a mysterious, all-powerful esper perfectly. Junichi Suwabe played the role of the eccentric, but naive Andy quite well and the young, up-and-coming Nao Touyama's portrayal of Yugiri was downright adorable. I even got a laugh at how dynamic the castmembers were. Aya Hirano played both Kaoru from The Children AND a young Kyousuke from flashbacks...and the scary part was I couldn't even tell she was playing both roles until I read the cast listing. Just more proof that Aya Hirano is one of the best in the business. I will give Manglobe one thing, they do excellent cast work and even I have to admit, I got a chuckle out of the subtle Nostalgia Critic and Angry Video Game Nerd reference in one of the episodes. Where The Unlimited fell a little short in my opinion, with the pun intended, was the length. Considering how detailed the plot was, it felt like there wasn't enough time to hash out the characters. It was slightly difficult to get attached to the other PANDRA members besides the leads because their exposure was limited and the supporting cast aboard the Catastrophe didn't get a whole lot of development. Although, perhaps they received that development in the original series and I just wasn't exposed to it, but it felt a little difficult to become attached to PANDRA's team dynamic. Considering the feel of the series, plot elements seemed slightly rushed at times. The team sort of jumped from one plot point to the next with little rhyme or reason. I also found the flashback back story to be a little out of place and slightly mundane. I didn't feel as though it added a whole lot to the story...or rather its focus didn't add much. It did play a big role in the story as it wore on, but I felt its focus was a bit off since it didn't seem to portray Saotome's character motivations very well. The way segments were edited during the series, it seemed as though this series was longer, but editorial mandate required things to be cut altogether. "Cut-and-paste" is really the best way I can describe this series at times. It didn't completely ruin my Unlimited viewing experience, but it was quite noticeable. On the whole, The Unlimited is a REALLY good series to watch if you're looking for a supernatural shounen series. It has an awesome plot and an interesting cast of characters (albeit somewhat underdeveloped) with excellent animation and a very nice, atmospheric soundtrack. While I wouldn't call The Unlimited an amazing series, I would call it a rather pleasant surprise. I got a lot more than I expected when I started to watch it. It's a shame this series just wasn't a tad bit longer because there was quite a lot of material to work with. This series certainly had a ton of potential. I did feel this series ended on a pretty good note since it had a satisfying ending. It concluded rather well, but also left enough open to continue if Manglobe does decide to do so. If nothing else, this series certainly did a wonderful job of advertising for its predecessor. I am somewhat intrigued to watch Zettai Karen Children now despite it being considered a somewhat mediocre series by the general public. Perhaps if these two series tie in well together, it might alleviate some areas of mediocrity both series might have had. I would highly recommend this series if you enjoyed animes like To Aru Majutsu no Index or Deadman Wonderland. It has similar psychic elements compared to Index, but also has the beautifully atmospheric animation and social commentary comparable to Deadman Wonderland, although not as gritty. Overall, the Unlimited isn't an amazing series, but is still a fun watch for those that enjoy some exciting psychic-powered action. This review will spoil nothing outside of the first episode. That said, the first episode has a great twist at the end that will likely have you raising your eyebrows in curiosity and shock, hopefully hooking you into it as it did me. Additionally, it's a super introduction to the series, so check it out if you know absolutely nothing about this show or the characters; it introduces the main cast, provides a taste of the series' dark tone, has a stellar climax, and a plot twist at the end to boot. Give it a shot, and then come back if you want to know what I think about the rest of the series. From here on, the first episode, and only the first episode, will be spoiled. 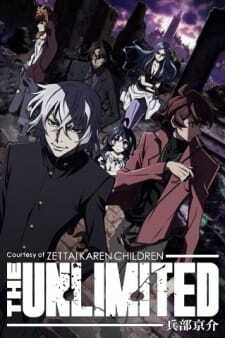 "Courtesy of Zettai Karen Children: The Unlimited - Hyoubu Kyousuke" was known in the U.S. as "Unlimited Psychic Squad", but is better known as just "The Unlimited - Hyoubu Kyousuke". It is a 12 episode seinen spin-off of the shounen manga series "Zettai Karen Children" which itself received a 51 episode series and is an all-around fun time, but not much better than a 7 out of 10. While its predecessor is very light and almost shoujo in some aspects regarding its tone and writing, The Unlimited is quite the opposite; while it has its share of comedic and heartfelt moments, the series as a whole is very serious, and revels in the darkness portrayed by villains who will stop at nothing and stoop to any low to see the main characters, or really all espers, killed or experimented on. Thankfully, this show is rather shy on displays of gratuitous blood and violence, but it has its moments that are not for the faint of heart, just not nearly to the degree of another series animated by studio manglobe, Deadman Wonderland. Overall, The Unlimited - Hyoubu Kyousuke is, at least in my opinion, a hidden gem of an anime that anybody who has love for Marvel's X-men or = superhero anime as a whole will enjoy, but also anybody who understands the struggles of being different from those around him/her and feels the need to fight to maintain his/her identity and not be victimized by it. This show is indeed a spin-off of a very long-running manga series, but fret not. Everything you could possibly need to know is explained in the first episode, and in well-written ways, not just overt exposition. Despite the amazing first episode, I feel obligated to summarize much of the series' opening act in this section. The setting is this: since shortly before World War II, people with supernatural ESP powers, also known as espers, have begun cropping up all over the world. One of our main characters is the leader of a quasi-terrorist pro-esper rights cell called P.A.N.D.R.A. That leader, Hyoubu Kyousuke, is an 80+ year-old man who is so overpowered he can literally make himself young and simultaneously dominate anyone who goes up against him. Most espers only have a single power, but he has a whole lineup of them, including hypnosis, telekinesis, teleportation, and even fire and lightning powers for a couple seconds. An easy analogy would be to compare P.A.N.D.R.A to Marvel's X-men, specifically the Brotherhood of Mutants and their crazy-powerful leader Magneto. Hyoubu is only the first of our main heroes, though. Andy Hinomiya is a Japanese-American who, at the end of the first episode, is invited to join P.A.N.D.R.A. as a junior member. What nobody knows is that he is actually an investigator for the United States Esper Investigations (USEI) and is attempting to bring the terrorist group P.A.N.D.R.A down from the inside while securing a secret device from them for his superiors. However, as Andy bonds with Hyoubu and the youngest member of P.A.N.D.R.A., an extremely powerful and vulnerable little girl named Yugiri, he calls the morals of his mission into question, and is caught between staying faithful to his esper-hating superiors and the new family that these apparent terrorists have built into their organization, a family to which he now belongs. Meanwhile, we get a deep dive into Hyoubu's psyche as well, allowing us to truly understand why he does what he does and how much he truly loves his people, whether they are with P.A.N.D.R.A. or not. Additionally, some characters from Zettai Karen Children appear, namely the titular Children and a few of their adult comrades, but they aren't really worth mentioning here, as while they do serve some roles in the plot, they aren't essential to the core of the story. Overall, though, I absolutely loved (no pun intended) the plot of The Unlimited; it's dark and depressing, but also hopeful and endearing. It features characters having to make impossible decisions that have significant ramifications for those close to them, but also captures a familial sensation unlike most anime before it. The story is engaging, the characters are dynamic, the character interactions are brilliantly written, and it's heartwarming to see our heroes overcome the odds that are stacked astronomically against them, even with Hyoubu being vastly overpowered. Samurai Champloo is a brilliantly animated series, but manglobe have really outdone themselves with The Unlimited- Hyoubu Kyousuke. To see an example of how good this series looks, just watch the opening theme; the animation from the show itself, believe it or not, actually surpassing what is seen there (a bit more on this in the next section). And it's not just the animation that's fantastic, but also the artwork: crisp, detailed, totally unique character designs combined with some amazing backgrounds really sell the look's quality, and all of these come together beautifully, with little to no CG, by the way, in some of the most incredible action sequences in anime before shows like One Punch Man, HeroAca, and Mob Psycho 100 captured the spotlight. Even if the story doesn't interest you, or you find the characters boring, but still have an appreciation for top-notch animation quality, you would be remiss to pass up this show. It's that good. Hoo boy, where do I even begin? Well, let's start with the show's actual score: it's great. The music is extremely evocative of the moments' tones, be they light or dark, especially in action sequences, which don't necessarily raise the level of hype so much as accentuate the reasons for the fighting that takes place, an important theme of the series. But let's move on to the real meat of this section: the opening and ending themes. While the show's action may not be all that hyping, the opening song certainly is! Not only that, as the show's story progresses, the opening's animation style and colors change, showcasing different visuals, schemes, and filters that reflect what is happening in the story at that time. For example, episodes 7 and 8 focus on Hyoubu's past as soldier during WWII, and for that reason, in the opening theme, Japanese fighter planes are seen in the background, the entire opening is in black and white (save for a bit of red later on), and there is almost a filter of static over of the whole thing. It truly is incredible to compare these 4 versions of the opening's visuals. There are actually 2 versions of the song itself, an English, and a Japanese. There are also 8, that's right EIGHT, ending songs, and the animation for the episode that ends on the song "ADVENT" looks especially incredible. All of these songs, though, are sung with beautiful vocals, and many of them are done by the voice actors themselves. There is no English dub for this show, but that suits me just fine. Much of the cast from the original series, Zettai Karen Children, reprise their roles for The Unlimited, and with they are all even better than before; Aya Hirano as Kaoru, in particular, was great in the preceding show, but was really captivating here. Aside from her, though, Kouji Yusa as Hyoubu and Junichi Suwabe were equally spectacular, as fitting for how their respective characters interact. Additionally, there have been something like 6 (maybe less, maybe more!? idk) different musical albums released for most of the characters, each with their own individual song(s). I highly recommend listening to as many of these as you can, because they really are amazingly done and catchy. It really hurts me, wounds me, even, that this show is so criminally underrated and, worse yet, so overlooked. It's like the Scott Pilgrim vs The World of anime; everything you could possibly enjoy in an anime (well, except romance) in a single show, and practically nobody bothers to check it out. It's surprised me how low a score this series has on MAL, and I could just be overhyping this show to no end. But as I look back on it, rewatch it, read the manga adaptation of it, etc., I found that this series is just really special to me, and, more importantly, it has the capacity to be special to a lot of people. So, while I could be overhyping this show, I really don't think I am. I'm excitedly passionate about it and want more people to experience it because they could and probably would really enjoy it, too. It brings something to the world of anime that, while not entirely unique in concept, is unique enough in story, animation, music, and tone to satisfy a lot of anime watchers, casuals or serious. 10/10, guys, 10 out of freaking 10.